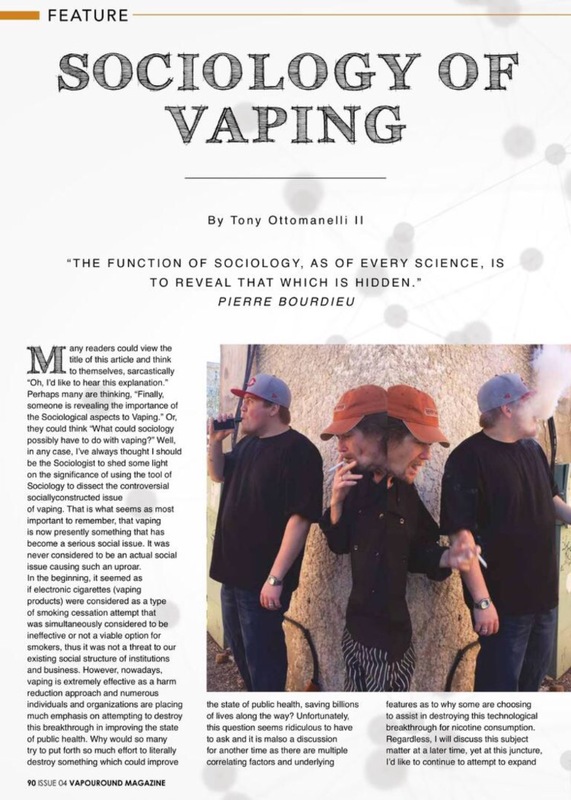 Sociological Vaperspectives – Who Are The Vapers? To Vape or Not to Vape? Is that Really the Question? Notice that my title is in the form of two separate questions. That is because not only am I a Sociologist, I am a researcher, a writer, a filmmaker, and most importantly a citizen of the United States of America. Therefore, many of the statements I make will always be in the form of a question. We must never begin to stop questioning the social construction of our reality and the societal forces that make up the society we live in. Society has become a necessity for human survival at least for the average American. It is no longer just simply food water and shelter is no food water shelter and society in which society provides food water and shelter leaving only society is the primary survival tool for humankind. This is because in America, our society is programming us to believe that we need it or at least subconsciously influencing our opinion on whether we are safer in or outside of American Society. Convincing us daily that it will be far more difficult for us experience the lives we want to live without some type of societal structure to adhere to and ultimately some authorities to obey. Of course, social influence is a healthy feature in this life we live for if we were not socialized or if we did not socialize with others, we would not be healthy human beings. Studies have shown that human beings are social animals; we need face-to-face communication, social acceptance, approval from our peers, and so on. Basically, we must continue to interact socially and exchange information with one another. Social communication is vital to the survival of mankind as a whole, pardon me, I meant to write humankind (The reason I informed you of this political incorrect vocabulary mishap rather than just edit that portion is because I want to tell you the truth: good or bad – and to constantly be honest in my writing endeavors, so I hope for my sake and yours we are all in agreement that this is a strange, yet extremely beneficial approach to social communication that we must comprehend fully in collaboration). Meanwhile, back to the subject matter at hand “to Vape or not to Vape?” that is one of the questions. And of course this is derivative of the Shakespearian expression from Hamlet, in which the widely-known soliloquy is, “To be or not to be? That is the question.” Although my title is deliberately modified, I’m sure you may have noticed that it was indeed, slightly altered. So hopefully you were able to pick-up on that poorly thought-out, cheap attempt at sarcasm when choosing a title. Regardless, Vaping is literally becoming one of the most important Socio-political issues of the 21st-century, primarily because it is in direct correlation to the state of our Public Health. I want to reiterate the word “our” when referring to public health because we, as Americans, need to be more united on numerous social issues. Though more significantly, we must have opinions and beliefs motivated by truth and facts, so the content of our education determines the quality and me must preserve the quality of our education. 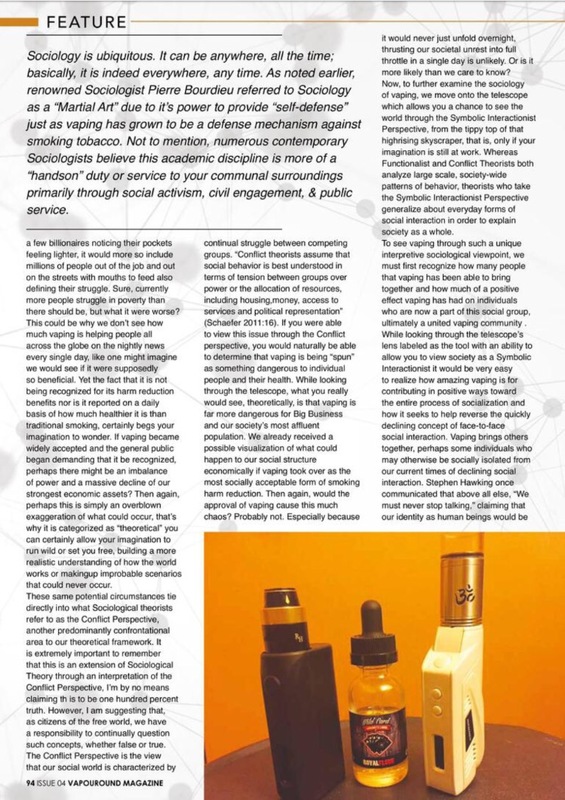 The topic of Vaping was never meant to be a social issue, it was never created with the intent to be confrontational in any way it is merely a creation of alternative nicotine intake, which certainly seems to resonate with public health debates in America. Nearly half a million Americans die each year to tobacco-related illnesses. Branding tobacco essentially as, public enemy number one, due to the fact that it is the number one killer of Americans. This is important to reflect on because Vaping Products contain no tobacco, whatsoever. However, they do, typically include nicotine, hence serving as an alternative delivery device for nicotine instead of smoking traditional tobacco cigarettes. The traditional tobacco cigarette also sometimes referred to as a combustible cigarette has become, as stated previously, public enemy number one or at least should be labeled as such. The only reason they are not is because the big tobacco industry is comprised of massive wealth and when I say massive wealth I mean nearly indestructible forces are at work due to the fact that they have so much currency…and then influence…and more power. This massive wealth that creates such power allows them to operate in a separate realm, far from our understanding of reality, in which the reality they function in is practically their own invention, they exist and operate in an alternate world we could not ever imagine being a part of. The big tobacco industry literally has more revenue than most countries. Of course, I’m referring to Third World countries or peripheral foreign countries of soveigrnty, yet nonetheless they are still countries with citizens who should have a right to choose what their children have access to and they definitely do not have that type of luxury that we so often take for granted. From what Ive learned, Big tobacco comes into these third world countries and sells their product which is, understandably, a great business practice, yet from an ethical standpoint or a more humane view, it is utterly absurd and amoral in nature; unjust. If they are public enemy number one, the number one killer in America, why are they given permission to travel all over the world frolicking across the globe advertising their product…which is death by burning tobacco for inhalation. I don’t want to reveal this, but I can’t help but think this is just another form of military occupation by invading another country and killing their citizens, but then again, they kill our own citizens daily as well and it hurts my heart. No, literally,my heart hurts because I smoked for 15 years. I burned tobacco for inhalation purposes, simultaneously receiving a nicotine intake but also inhaling a build up of carcinogen-infested tar, a deadly concoction of added chemicals, manufactured chemicals and naturally existing toxins caused solely by the combustion of tobacco. Regardless, my smoking days are over and tobacco-cigarette consumption is in my rearview mirror; they’re in the past, a mere memory, but the damage has been done to my body and I can never take that back, especially because it was my choice to smoke. So, I except responsibility, but I don’t accept unyielding, relentless ignorance spreading and expanding throughout the planet we share. It was never my responsibility to manufacture these tobacco cigarettes nor do I or did I supply them to the public. Manufacturing and supplying services for tobacco are left up to the tobacco companies or should I say, global corporate conglomerates (if you don’t know what that means look it up online or in any Sociology Textbook and you’ll understand where I’m coming from). If you are a smoker and you are reading this shaking your head, thinking: “who does this guy think he is?” Well, I understand that reaction entirely, I probably would be doing the same thing if I were still smoking because when I was smoking I was largely in favor of Big Tobacco in the name of economics and American superiority. When I was a smoker, I truly thought the new electronic cigarettes were a joke, that they were nothing more than something a “poser” would use or perhaps a “yuppie” activity. Boy, was I wrong! I was far off the beaten path and I believe I am correct now when I state that electronic cigarettes and vaporizing devices are the solution to the increasing deaths that tobacco is responsible for. Overall, I switched to Vaping 2years ago, quitting smoking traditional cigarettes altogether. I smoked one cigarette three weeks after I began to use electronics and it literally made me nauseated to the point where I felt as if I were going to vomit. Swearing off tobacco cigarettes entirely and focusing on Vaping strictly immediately became my everyday personal choice in habitual behaviors. Thus, Vaping CAN save us, it has saved us, it will save us, it will be our savior. 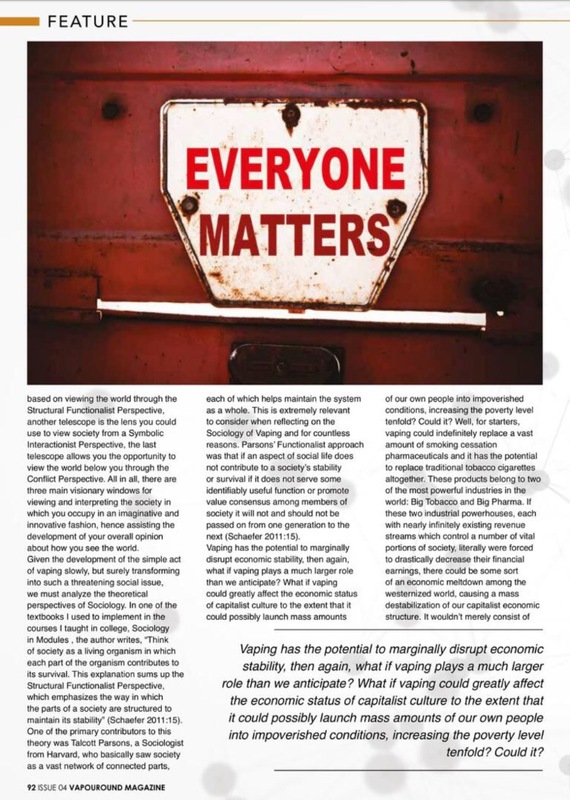 Coincidrntally, many people disagree and choose to say and share some deliberately untruthful things about the act of Vaping, claiming the many health risks are imminently involved or the economic disadvantage it could cause would be purely devastating. Yet, so far every VAPER I’ve had the pleasure to meet has been a former smoker and proud to now Vape. In this digital era we live in, there are fewer people to have meaningful face-to-face verbal exchanges with nowadays. Therefore, most of my conversations are with those who choose to vape. Vapers are extremely sociable, not to mention grateful, patient, professional, confident, educated, technical, expressive, forward-thinking and passionate individuals. They will continually stress the fact that Vaping has saved their lives; claiming to be feeling so much better than when they were smoking, claiming to have more money at the end of the day since tobacco products were so expensive, claiming to have an overall better sense of health and well-being and ultimately claiming that the quality of their lives has improved drastically, in many ways. 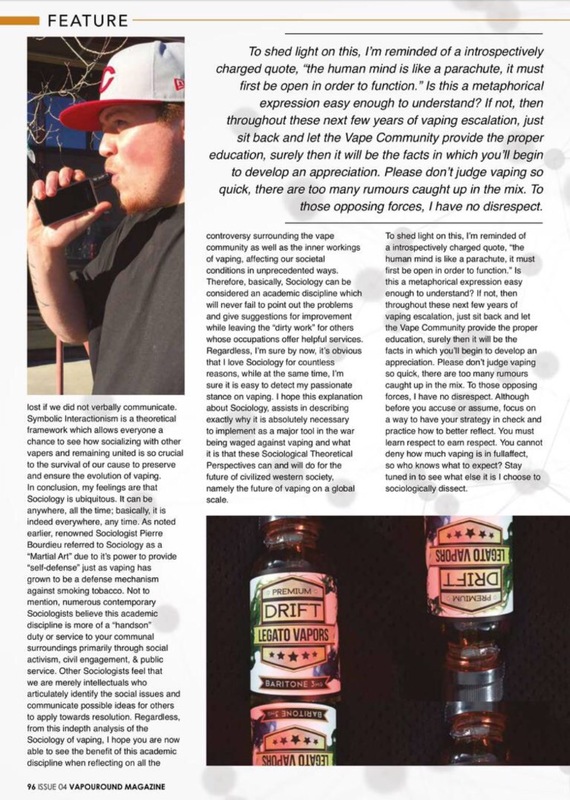 Some people have even accused Vapers of being annoying and impulsive, due by and large to the fact that Vapers seem as if they’re purposely forcing their own ideas and personal habits onto others far too often. However, what it is that we are actually doing is trying to inform people and educate them on how much safer electronic cigarettes and Vaping products truly are when compared to tobacco cigs. We’re trying to share our true stories of redemption, we’re hoping to show others that they too could cut tobacco smoking from their lives forever, we’re trying to help people. So me might say “why do Vapers think the smokers need or want their help?” Well, that is of course because the Vapers all used to be smokers, they used to be in the same pair of shoes, so they have genuine empathy for a smoker’s situation, in which their situation includes a faster paced road to a painfully ill experience before imminent death, something much far worse than we may experience in a prolonged natural death. People might say, if this is the case then, “where’s the scientific evidence? 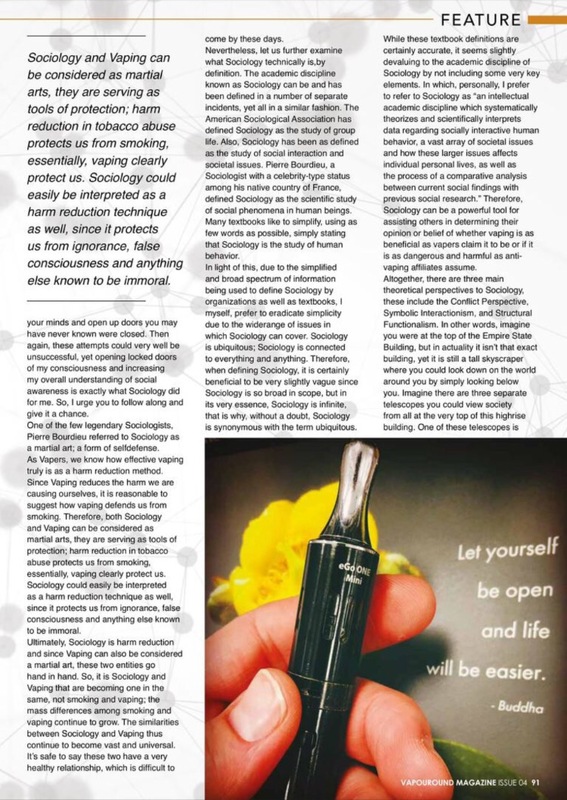 There are not yet any long-term studies to prove this, so how do you know that electronic cigarettes and Vaping products are much safer than traditional cigarettes?” In which these are all great questions and valid points. Then again, the scientific evidence is there, it does most certainly exist, you just have to find it online, as I urge you to seriously research this data, self-educating is some of the best therapeutic activities you could partake in, due to cognitive stimulation. Coincentally, another advantage of Vaping nicotine, improving cognitive function is seriously being linked to the intake of nicotine, not tobacco, but nicotine for certain. In regards to the argument of lacking long-term studies, all I can say is that the short-term effects have been so positive early on that I doubt there will be very much long-term disadvantages or harmful outcomes in the future for those who choose to vape. Nevertheless, in times like this, I think it is wise to perform your due-diligence and research factual information and scientific data from research studies that are not funded by big tobacco interests as well as avoiding data modified by Big Pharmaceutical interests to protect the revenues they receive from smoking cessation drugs. Don’t simply except the answers given by junk science or hack reporters from paid off mainstream media articles. Sometimes you gotta look between the lines; deep within the cracks, not always staring straight ahead at the very first thing you see in front of you we were listening to the very first thing about the subject matter much like all of the information content shared by the main stream – you have to go underground to find the real information that is genuinely produced for factual analysis and improving communication. An honest interpretation. Look at the research and data that has been published by academic journals, Vaping advocates or Vaping industry organizations or a select few public health journals and compare and contrast all of the evidence. In conclusion, “To Vape or not to Vape?” was the question and I think we know the answers now. I think it is time we take charge of our lives and choose where we will get our information from, which information we choose to absorb and how we interpret it. Not just for your own sake but for the sake of this great country. Regardless, whenever there is an issue which involves people dying at alarming rates, more and more, younger and younger, and we have the power to do something about it, then the answer is clear, we must always: choose humanity over vanity.